Remember way back when and there was that guy who gave everyone lots of unsolicited advice and he said the most important thing was to wear sunscreen and for some reason there was really annoying music playing in the background? Yeah? Yeah! I think he also said I should dance like no one is watching and live in New York at least once and LA at least once. But that I should leave before one made me hard and the other made me soft. Which leads me to believe that I should just live somewhere in the middle, so I can stay . . . soft yet firm? Huh. I was thinking that I have piles and piles of advice that I too can dole out despite the fact that no one is asking. But instead of doing mine all spoken-word style, I thought I'd do something way more rad. 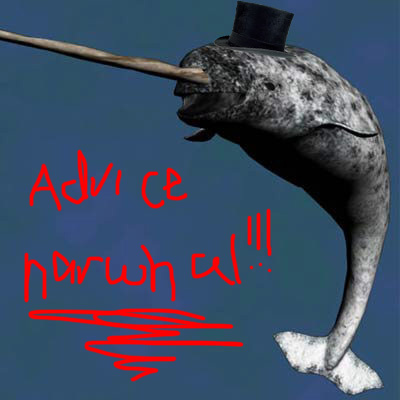 I present to you: Advice Narwhal. He's going to be here on my blog every now and then to dispense very important advices. You should listen to him: he's wearing a top hat, so he must know what he's talking about. Right? If you are a model/designer/person/whatever, and you collaborate (be it paid or unpaid) with a photographer, and at some point after the shoot, they provide you with a selection of unedited sample shots for you to peruse through, do not--I repeat--DO NOT upload those photos to your Facebook page or Twitter account or Blogger or whatever. A photographer providing their client with an unedited sample is a very kind thing that not all photographers do. Sometimes it's just so the rest of the people who worked on the shoot can have a little sneaky-peek; other times it is so the others involved can pick out which images they like best so the photographer can edit them. So unless you have the consent of the photographer, please do not publish their unedited samples. Just, no. No. N-O. NO, NO, NO. No. It very well might be a yes-yes-yes, but they will tell you if that is so. And if you were informed of this industry standard dealio by your photographer and still decided to publish their unedited samples, well, there must be something wrong with you. And there is absolutely no justification for your actions. It is so very rude and disrespectful to not only go against the photographer's wishes, but to also take it upon yourself to show their unfinished work to the world. It would be like smacking a vegan in the face with a piece of raw meat. Probably. And there you have it. Thanks, Advice Narwhal! You are very wise. What will you advise us on next time, I wonder? Oh golly--I can hardly wait. genius advice. let's hope it goes viral. I enjoy you, a lot. Seriously, your humor comes across so well in the first part of the post, you write just like how my best friend talks.. she's kind of a weird, quirky one, but it's absolutely hilarious. AND, you are SO right on with that advice. Kind of an odd example, but my mom went and got boudoir pictures done several months ago and the photographer sent her a sample of the different shoots and she wanted to crop them and put them on Facebook! I stopped her, one because even if they are cropped.. boudoir pictures are NOT something you share on facebook, but secondly, they hadn't been edited yet!